As the deadline for Zlamushka’s Tried & Tasted event is approaching, yesterday I went for a stroll in Sia’s Place. As we all know, Sia is admired not only for breathtaking pictures but also for her delicious recipes. So after spending at least an hour (seriously!) at her place, trying to make a hard decision what to select, this Goli Baje recipe caught my attention. This was so easy to make and tasted delicious too. Thanks for such a wonderful recipe Sia! I followed her original recipe to the letter. The little changes I made were, adding dried ginger powder instead of fresh ginger as I don’t have it on hand and using all purpose flour instead of maida/plain flour as suggested in the original recipe. Anyway, I will give the recipe in the way I did. Mix all the ingredients above except oil and make a thick paste. Keep it covered for 2 hours (Sia suggested to keep it for 2-3 hours). Heat the oil in a deep-bottomed pan. When it is hot, take small portions of the batter or paste with a spoon and drop carefully in the oil. Be careful not to burn your hand. Deep fry them until they turn golden brown in color. Keep the flame in medium setting. Serve hot with any desired chutney and a cup of hot tea/coffee. These Goli Baje tasted so soft and delicious too. Thanks for the yummy recipe Sia! In the original recipe Sia suggested to serve these with coriander chutney for which also she provided a recipe. But I didn’t make her chutney as I have the cilantro pickle we made some days back resting the refrigerator. So I used that pickle for dipping these yummy Goli Baje. I am Sending these Goli Baje to Zlamushka’s Tried & Tasted: Monsoon Spice. And these also go to “WYF: Party Food” event hosted by Easy Crafts. Wait, wait! I forgot one more event!!! These Goli Baje are also my contribution to Hima’s “Sunday Snacks: Fry It”. Goli Baje looks crisp and yumm Uma..nice one.. This looks really delicious. Have never had them. Wil go and check her place too as i don't remember seeing it there. Looks really yummy and delicious. Goli Baje looks so yummy uma!the chutney is a perfect combo! That looks so shiny and inviting! Nice pick. I like the golden brown color..Perfect with tea Uma..
Bajes have a thing about them, don't they? For all the apprehension of 'fried food' they're still appetising. I have not heard the name goli bage, but it's known to be as Mangalore Bonda. Sometimes it's difficult to believe that something so easy to make tastes so good. This dish is one such example. 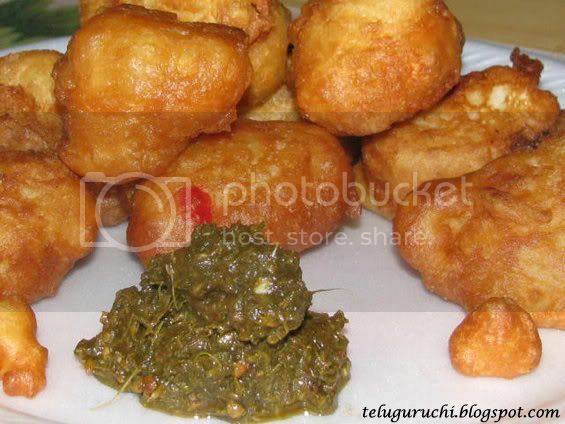 Goli baje looks absolutely smashing, what a great snack. This is a wonderful snack Uma. Look so good. I also make it in the same way with some onions on it.... YUM! We call them as mysore bajji. Thanks uma for sending such a wonderful favorite of mine. 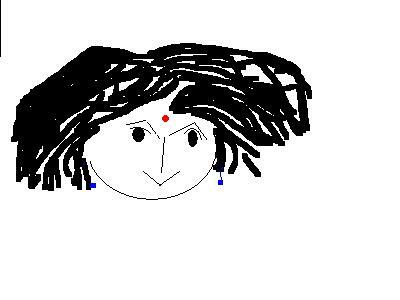 Happy Dusshera to You and your family Uma!!! glad u enjoyed a very traditional recipe from m'lore uma. it sells like hot potatoes on streets :) and urs look perfect, crisp from outside and soft from in. and that chuteny u have there looks divine. 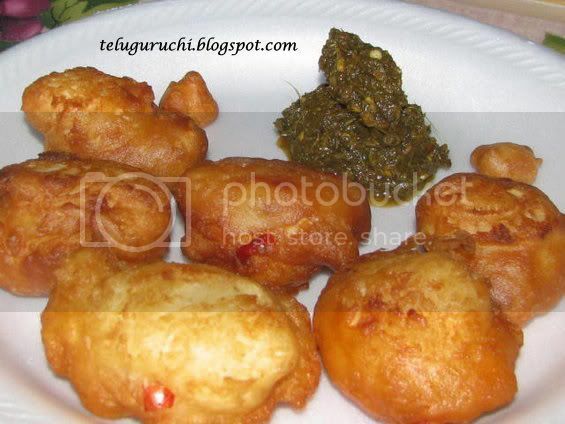 Lovely goli bajes,!I have to try this and i dont have dry ginger powder, may be I could add ginger paste instead,What say? its so colorful and inviting. sure i ll prepare for eve snacks tomrw.tnks for postin such a nice and crispy one. one recipe to three events, that's multitasking :) the goli baje looks great! WOW this looks so yummm, nice recipe and awesome click!!! Uma, thanks for re-introducing this one. I think I must have overlooked this one. So fluffy and cripsy, I love it! That looks perfect. I've tried this from Ramya's blog and it was yummy and so easy. Looks very tasty Uma, Love the pic`s too. Happy Dasara to you and yours! Beautiful picture of the bhajji! Ok i'm going to invite myself over to your house now :-) Those look yum! This is something I have had our office canteen so often! Tastes great! Looks like you took the picture immediately after it was out of the wok - fresh! 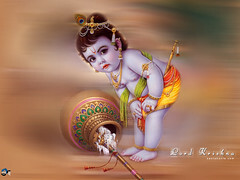 Wow Uma....Goli baje is my favourite! Whenever I visit my native place this is the only snack I have :) Let me hop over to Sia's place and thank her. I will definitely try this out now.